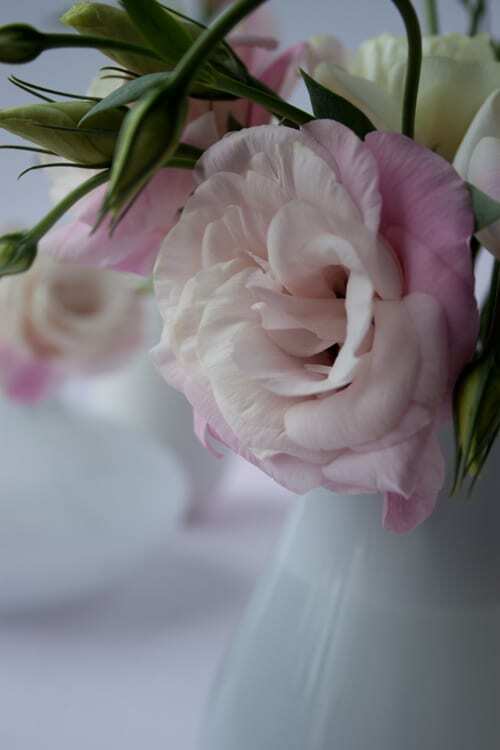 Lisianthus blooms have such a soft, feminine look and they’re so long-lasting. They’re the kind of flower that people admire, but very few know their name. I’ve known those who mistake the double-petalled varieties for roses and even peonies. Delicate trumpets of white, purple, pink, cream, lilac or bi-coloured flowers in single and double-petalled varieties. An example of bi-colouring is white petals with a purple rim. Florists, supermarkets and garden centres. Make sure when you buy them that at least one flower is open on each stem. Cut the stems on a slant with scissors and place them in a clean vase with fresh water. Do keep them away from bright sunlight as they don’t like humidity. They’re also known as prairie gentians or Texas bluebells. And I’ve heard and seen them called Lizzy at flower markets. Lisianthus means ‘bitter flower’. This refers to the taste of the flowers which were traditionally used in herbal medicine…not of course, something I’d recommend nowadays! How wonderful! I have never heard of these but my favourite two flowers are peonies and roses so I must learn more about these. They do look beautiful, love the soft delicate pinks, lovely photos too. Thanks for introducing me to a new flower to love! You’re very welcome Rosie…lisianthus are very readily available, so you shouldn’t have too much trouble hunting them down. Thank you for your lovely comments about my photos too. Very nice short, yet complete description of this beautiful American native flowers. They are available in florist shops in Australia, where I am. Hi Kathryn. Thank you for comment. I’m really sorry but I don’t know… Might be best to do a general search in Google? Unfortunately they are toxic to cats so I have to love these beautiful flowers at a distance as my cats love to play with flowers. My favorite flower ,so delicate and long lasting.I put these on my husbands grave one of the only flowers that the rabbits don’t eat,would you know if deer eat them as my brother has the same trouble with his late wife’s grave . how can i propagate lisianthus? I’m very sorry…but I don’t know as I’ve only dealt with the cut flower. Perhaps it may be a good idea to pop into your local garden centre who may be able to help? A friend said these were her favourite flower and the picture she had of them looked so pretty that I googled and found your site. In Canada lisianthus seeds are available but must be started indoors 12 – 16 weeks before the last frost. Oh well, there’s always next year. It’s not often I meet another Rona :-). Thank you very much for popping by Flowerona and I hope your lisianthus growing goes well next year! Hope your lisianthus growing is very successful Jacky :-). Thank you Rona loving your website really inspirational. Thank you so much Jacky for your lovely comment :-). I grow Ivory, Blue, Pink, Yellow and Lime Lisianthus every year from seed. They need to be started VERY early indoors (December) and take a very long time to mature enough to be put outside. I am in zone 6A and even though they go out the end of may, I don’t see blooms for a month or more. They are sooo worth the wait. I have just bought a beautiful Lisianthus, plant in a pot, should this be kept indoors or is it hardy? It really depends on where you live…I think it would be advisable to check with the place you bought the plant from as they’ll be able to give you the best advice. Here in Malaysia eustoma is the flower wedding planner love very much. 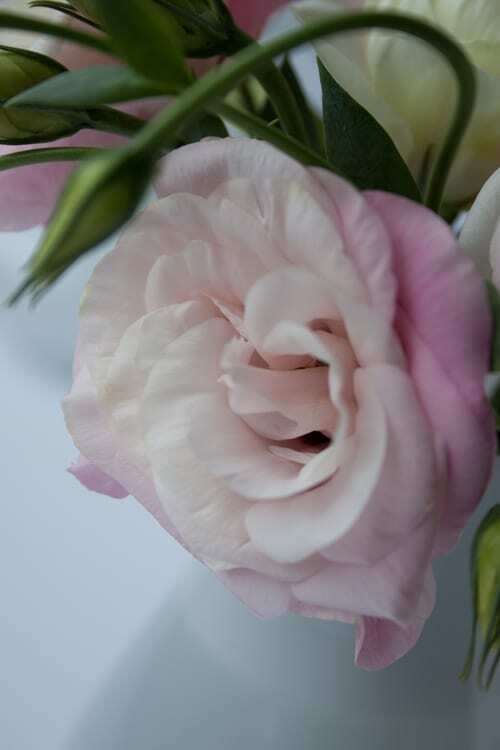 As we are in the tropic I am not sure where my supply came from but i truly love this flower – in this humid country roses is a gamble but eustoma stand tall and bloom so perfectly up until two weeks! Thank you for simple and good reading and of course nice picture of it.